WINNIPEG, MB - With the help of youngster Patrik Laine and newcomer Joe Morrow, the Winnipeg Jets have collected their first postseason victory since returning to Manitoba. 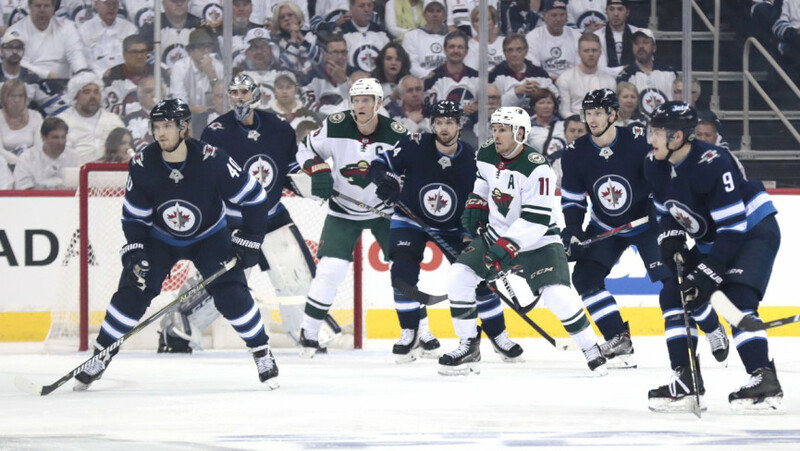 With the Winnipeg Whiteout in full effect, the hometown Jets built off of a shaky start and a blown lead, en route to jumping out ahead 1-0 in their opening round matchup of the 2018 Stanley Cup Finals against the Minnesota Wild. Although coming out to the deafening roars of 16,435 Jets fans dressed in white from head to toe, Winnipeg failed to bring their hometown supporters to their feet in what was a relatively slow opening period of play. Minnesota stuck to their game plan in the opening frame, limiting Winnipeg to just four shots through the first nine minutes of play and in the process, slowing Wednesday’s game down to a crawl. 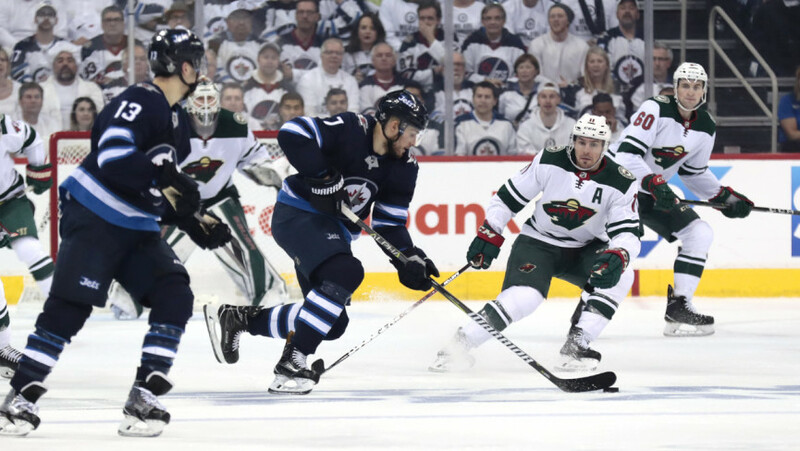 The Jets’ offence seemingly came alive midway through the frame as the home team rallied late, ending off the first period with 13 shots – a sizeable advantage over Minnesota’s four. The difference through 40 minutes was the play of Wild netminder Devan Dubnyk. Cleaning up the crease on multiple occasions, the 6-foot-6 monster tendy kept the Jets off the scoreboard for nearly two full periods of play. It took Winnipeg until the 37:37 mark to find the twine. With Minnesota’s Nate Prosser in the box for holding, Winnipeg wasted little time, needing only 20 seconds to score their first power play strike. Dustin Byfuglien moved the puck to Blake Wheeler, who found Mark Scheifele all alone in the slot. 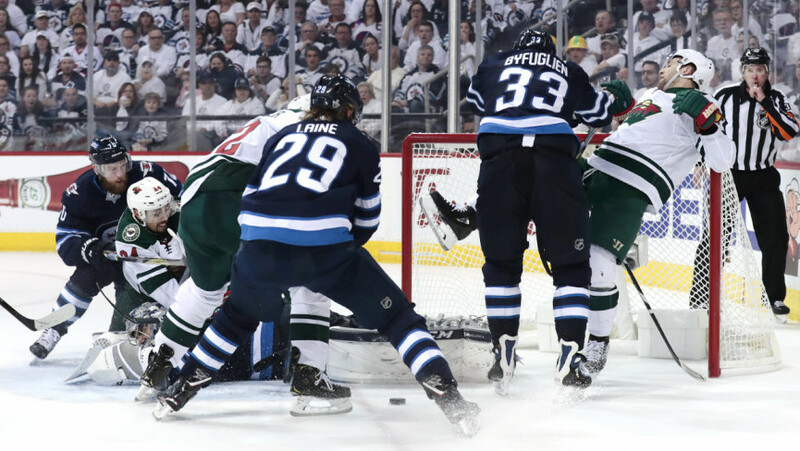 Scheifele one-timed a powerful clapper past Dubnyk – much to the pleasure of those gathered at the sold-out Bell MTS Place, and those at the neighbourhood street party outside the arena’s front doors – for the Jets’ first goal of the 2018 playoffs. The second period ended with the Jets up 1-0 on Scheifele’s first. Although only teaming up to score one goal through 40 minutes, the two opponents put up three goals in the first five minutes of the third period… in typical playoff hockey fashion of course. First, Jordan Greenway – playing in his first NHL playoff game – found Matt Cullen (200 games of NHL playoff experience) who put the puck past Connor Hellebuyck just 1:46 into the third period. 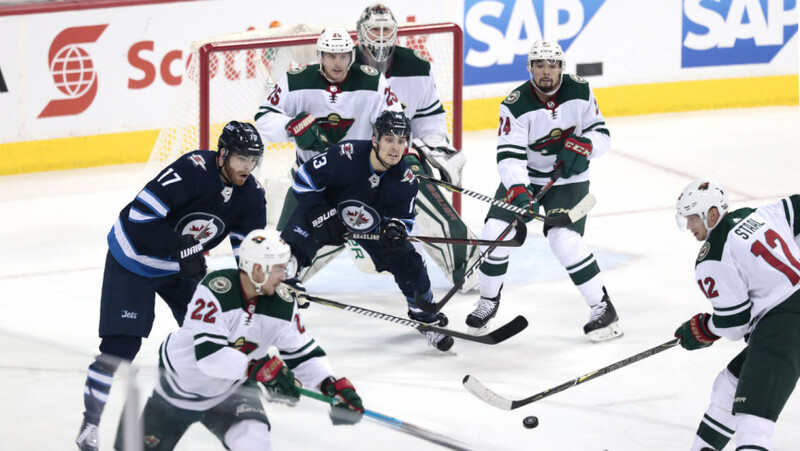 The Wild kept the pressure on, jumping ahead to a 2-1 lead two minutes after Cullen’s strike on a great individual effort by Mikael Granlund. Following a bad read by Dustin Byfuglien, Granlund walked into the Jets’ zone unscathed, before dancing around both defenders and sliding the puck cross-ice to Zach Parise. The goal was the 33rd postseason marker for Parise. Although some say that silence can be deafening, the solemn mood at Bell MTS Place following the Wild’s go-ahead goal was short lived. 53 seconds after gaining the lead, Minnesota gave the puck up to trade deadline acquisition, Paul Stastny. Stastny dropped the disc to Laine, who took his time before wiring a wrist shot past Dubnyk, top cheese. The Minnesota netminder then spent the next ten seconds looking for the puck in his net. Yes, Laine’s shot was that deceiving. The game-tying-goal by Laine set a new Jets/Thrashers franchise record as Laine became the youngest player to register a post-season goal for the franchise. With seven minutes to go in the third, another trade deadline acquisition, defenceman Joe Morrow made his presence felt. Picking up a Nik Ehlers setup, the 25-year old blasted a slap shot off of a Wild stick and past Dubnyk, five-hole. Surprisingly, it was the sixth postseason goal of Morrow’s career. With the Minnesota net empty for the extra attacker for the final 2:30, Winnipeg was unable to hit the open net, often finding themselves icing the puck. Centreman Adam Lowry won all his defensive zone faceoffs in the final two minutes, propelling the Jets to a tight 3-2 victory at home. After having his bell rung a handful of times in the opening 40 minutes, Winnipeg’s Mathieu Perreault left the game and did not return for the third period. He finished with a grand total of 6:52 on the ice. Winnipeg finished the game with 40 shots, as compared to Minnesota’s 20. Hellebuyck stopped 18 of 20 pucks, while Dubnyk put up 37 saves in defeat. The two teams will take Thursday off before resuming their battle Friday evening from Bell MTS Place. Puckdrop is set for 6:30 P.M. central time. Once again, the game can be viewed live on Sportsnet.